Note: Depending on your service or region, this feature may not be available to you. Microsoft Skype for Business Web Scheduler is a web-based program that you can use to create Skype for Business Meetings if you don’t have Microsoft Outlook, or are on an operating system not based on Windows. With Web Scheduler, you can create new meetings, change your existing meetings, and send invitations with your favorite email program. Your company’s support team gives you the link to Web Scheduler portal, and a user name and password to log on. When you’re on the page, click the tabs to access different options, or use the Tab key on your keyboard to get to the option you want. Go to the Web Scheduler page that was provided to you by your company’s support team. Type a Subject for your meeting. You can leave the meeting location as Skype for Business Meeting, or add a location, such as a conference room, if you have in-person attendees as well. Type a short message, or the meeting agenda in the Message box (optional). Select the Time Zone, Start and End date/time of the meeting. By default, everyone including people outside your company can bypass the lobby, which is a virtual waiting area that lets you admit people or deny access. For information about how to change the options, see Access and Presenters. By default, anyone from your company has presenter permissions. For information about how to change the options, see Access and Presenters. 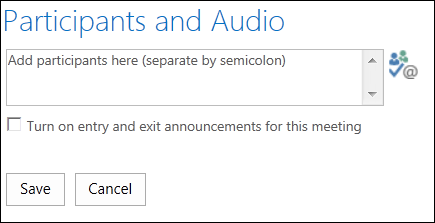 Under Participants and Audio, add the invitees’ names or email addresses, separated by a semicolon (;). Click Check names to verify that you have the correct names. For invitees who are external to your company, type the full email address, such as contoso@contoso.com. Note: We recommend that you type the full email addresses of the invitees. Web Scheduler can only resolve names of employees in your company if they are unique and no two people share the same name. With this method, you copy the meeting information from Web Scheduler and paste it into a meeting request that you create with your favorite email program. Highlight the meeting information, including the meeting URL. Paste the Skype for Business Meeting details (copied in step 4) into the request. Add the participants, verify the meeting date/time, type a meeting agenda, and send the request. iCalendar lets users of different email systems exchange calendar information. Recipients of the iCalendar requests must have software that is supported to open and respond to the meeting request. The invitees can then open and save the iCalendar file with their preferred email program, such as Outlook, Notes, iCal, and so on. The default meeting options are best for typical team meetings. You can customize your meeting options to better fit your requirements, meeting type, and the participants. When you’re creating a new meeting, under Access and Presenters, select who can bypass the lobby, and who can be a presenter. You’re the only one who gets into the meeting directly. Everyone else has to wait until admitted. You don’t have external participants and you aren’t discussing confidential information. You will be the only presenter. Anyone from your organization will be a presenter. Suitable for causal meetings with your teammates, where all participants can share and change content. Note: When you select People I choose, click Choose Presenters, and move the participants from the Attendee to Presenters side. External invitees and distribution lists can’t be added as presenters with this option. However, you can give presenter permission to individuals when you’re in the meeting. Click the meeting link in the meeting request to sign in. Under My Meetings, select the meeting you want to join. On the right side of the page, click Join Meeting. The appropriate Skype for Business client opens and signs you into the meeting. For more information, see Join a Lync Meeting. You can see all the meetings that you’ve organized under My Meetings in Web Scheduler. Keep in mind that Web Scheduler lists only the meetings that you’ve organized, not the meetings you get requests for. Go to My Meetings, and then click a meeting subject to open the details page. Click OK on the success alert, and verify the changed information. If you used iCalendar to send the invitations, click Export as iCalendar again to open the request, and send an update. If you copied the Skype for Business meeting details in a regular meeting request, open the invitation, update with the new meeting details, and re-send to your participants. Important: You’ll need to send a cancellation notice to your participants, because Web Scheduler doesn’t update your calendar automatically. If you used iCalendar to send the meeting request, open the invitation and click Cancel. This sends a cancellation note to the recipients. If you copied the Skype for Business meeting details in a regular meeting request, open the invitation, then click Cancel to send a cancelation note to the invitees.